Dynatrace offers multiple channels for receiving alerts to detected problems in your environment. In addition to traditional channels, such as email, we also offer direct integrations with many popular third-party channels, including Slack, JIRA, and OpsGenie. In addition to these options, you can also receive alerts via the Dynatrace mobile app. The Dynatrace mobile app, which is available for both iOS and Android, delivers push notifications to your preferred mobile device and offers quick insights into all problems detected by Dynatrace. Problems from the last 72 hours are fetched and updated in near real-time, so the Dynatrace mobile app offers a convenient way of staying up-to-date on the state of evolving problems in your environment. 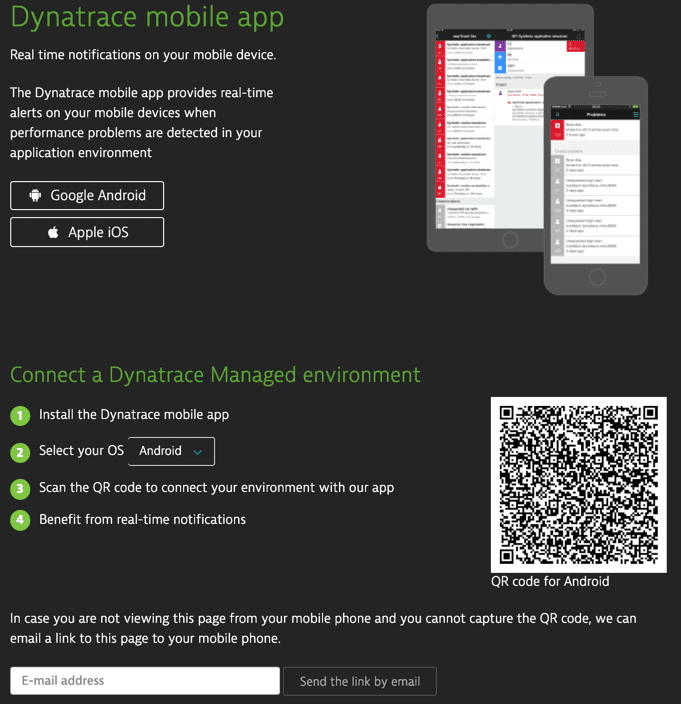 The Dynatrace mobile app enables you to track multiple Dynatrace environments. 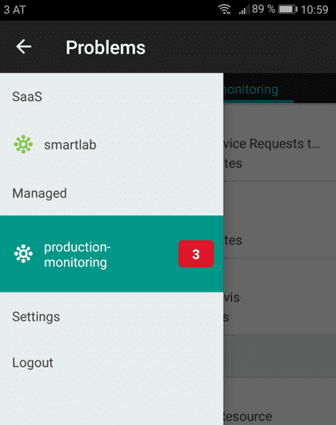 See for example below, which shows the Dynatrace mobile app set up for push notifications from one Dynatrace SaaS environment, (smartlab), and one Dynatrace Managed environment (production-monitoring). The Dynatrace mobile app can be installed on the following operating systems. Before connecting your environments with the Dynatrace mobile app, you need to download the app through the iOS App Store or Google Play. You can also find the download links on the page that appears if you select Receive alerts via mobile app from the user menu in the top right corner of the Dynatrace menu bar. To add all your SaaS environments, log into the mobile app with your Dynatrace SaaS account login. All your environments will appear as tabs. In case your Dynatrace Managed server is running behind a corporate firewall, you must first set up a Cluster ActiveGate that is accessible from the internet. Make sure that your firewall is configured to allow incoming network connections to the configured Cluster ActiveGate domain on the configured port. If there&apos;s a firewall in front of the Cluster ActiveGate, make sure that it is configured to send the correct security certificates. From your mobile device, access your Managed environment. From the user menu on the menu bar, select Receive alerts via mobile app, to enter the connect page. to scan the provided QR code with a QR-code reader and connect your environment with the app. to receive a connection link in your registered email account. When you click the link, a user-specific API token is generated. This allows the administrator to prevent push notifications from being sent to the specific user by deleting the user token. 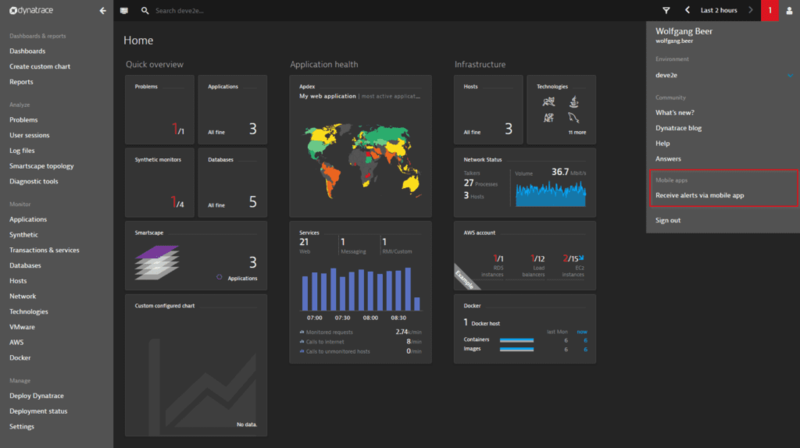 Once your environment is successfully connected, you’ll see your Dynatrace Managed environment listed with the other environments you’ve connected with your app. Note: In step 1, in case you don&apos;t access your environment from your mobile device, you can have the environment connection link sent directly to you by email, as indicated on the connect page (see the image in step 3). Once you’ve received the link, open it to get the connection link shown within your Dynatrace Managed web UI. This section explains how your Dynatrace Managed cluster communicates with the Dynatrace mobile app. The communication is two-way. First, the Dynatrace Managed cluster pushes minimal information (only the problem title and the problem unique ID) through Mission Control. Then your mobile app can fetch all detailed problem information on demand. Just click a notification to fetch updated info about a problem. Access to the problem details API is established through a Cluster ActiveGate. Access is secured by the automatically generated user-specific API token mentioned above. This token is restricted to the mobile app REST API and can&apos;t be misused for other API calls or to log into the cluster. The following diagram illustrates how push notifications are sent out to your iOS and Android mobile devices and how problem details are fetched on demand.